The new amateur radio educational project will be launched under the name "RadioNow"
Youth learn and practice their amateur radio technique at a summer youth Academy in Romania. Cezar Lesanu, Y08TLC, co-manager of the RadioNow Project. 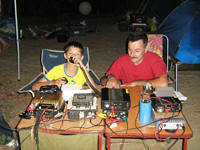 RadioNow will create new educational opportunities for youth across many areas of amateur radio. 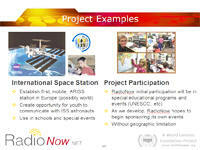 The World Genesis Foundation announced today the launch of a new project called "Radio Now" that will begin to offer new educational opportunities in Amateur Radio for youth in Romania, the United States, and soon other regions of the world. "Amateur Radio is a wonderful education tool that I've seen capture the fascination and attention of youth again and again, said David Lewis Anderson, President and CEO of the World Genesis Foundation. 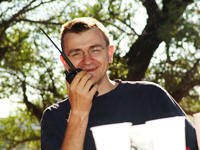 In Amateur Radio students can almost always find something to capture their attention and want to learn. This might include communications skills, physics, electrical engineering, computer programming, emergency communications, cultural awareness and understanding and so much more. It is a powerful educational tool and a good life skill as well." Leading the project with the World Genesis foundation will be Mr. Cezar Lesanu of Romania, call sign Y08TLC. Mr. Lesanu has been actively practicing and teaching amateur radio skills and classes on an international basis, including as a regular instructor of amateur radio classes at UNESCO learning academies for youth. Intial plans include the development of a mobile station for ARISS (International Space Station) and also two internet-linked radio stations, one in eastern Europe and another in the United States. Other plans are also being developed that will be able to be viewed on the project's website, www.RadioNow.net, which is expected to be online the end of this year. The website will also include many educational features and also records of historical projects previously sponsored by Mr. Cezar Lesanu and the World Genesis Foundation. The World Genesis Foundation was founded on November 30, 1999 and is a 501c3 not-for-profit organization dedicated to a vision and mission to "leave no child without hope for the future." Headquartered in Santa Fe, NM USA, the foundation supports activities worldwide to create educational, scientific and cultural opportunities for youth with a special focus in areas of the world where these opportunities are limited or do not exist. If Yes, please click on the Heart below to start your shopping and a part of every purchase will be donated to create new projects for youth! It's FREE and EASY to Create Hope. Click on the Heart above to make a difference! There are many ways to join our mission to "leave no child without hope for the future." Sponsor a youth project or event. Volunteer to support or participate. Make a Donation to create new opportunities.